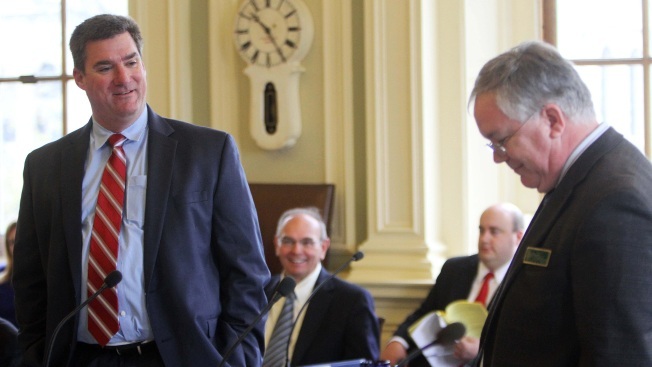 State Sen. Ray White, R-Bedford, right, reacts to a response by Sen. Andy Sanborn, R-Henniker during debate on the Senate floor in the Statehouse Wednesday, May 2, 2012 in Concord, N.H. Newly released documents suggest a New Hampshire state senator accused of making an inappropriate comment about a female staffer was not allowed to have an aide assigned to his office until he agreed to complete sexual harassment training. The attorney general's office recently cleared Bedford Republican Andy Sanborn of allegations that a Senate intern was paid to keep quiet about an inappropriate comment Sanborn made to him. This week, the office released interview transcripts in which Sanborn was accused of making a second inappropriate comment. Another senator said Sanborn initially refused to complete the training, and that may be why he went for a period without an assigned aide.